Nevo Energy substantially developed one of the world's largest photovoltaic solar farms to supply Northern California with clean, renewable energy and then sold the assets of the project to PV2 Energy, LLC. Nevo Energy retains a residual interest in the project. 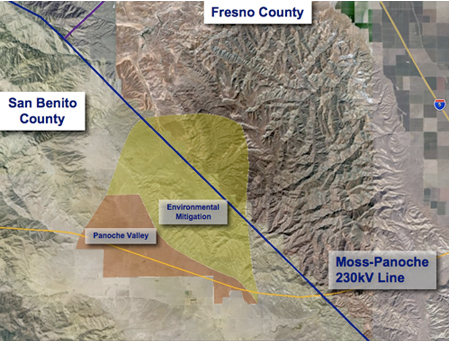 The Panoche Valley Solar Farm continues to be developed by PV2 Energy with a planned capacity of 399 MW. The project will take advantage of the advancements in photovoltaic technology to provide a solution to the growing demand for clean energy mandated by the State of California to meet the Renewable Portfolio Standards (RPS) for renewable energy. The project location is attractive with high solar energy and in close proximity to high-capacity PG&E power lines. Size: Approximately 16,000 acres of land has been secured in this location, of which approximately 4,717 acres will have solar development. An estimated 2,500 acres will have solar panels covering the landscape. Panels will serve as shade for grazing sheep and collect moisture for plant growth under and around the solar collection system. Phase one of the project will be approximately 20 megawatts in size. The project will be built in multiple phases over many years. Location: The project is located in the Central Valley near Highway 5 and in Panoche Valley near a major transmission line. The site is in a micro-climate which the National Renewable Energy Laboratory (NREL) confirms to have high solar radiation and optimal conditions for photovoltaics. Transmission: The transmission line connecting the Moss landing power station with the Central Valley runs directly through the property. Demand: The State of California has increased its Renewable Portfolio Standards (RPS), the allotment of energy required to be produced from renewable sources, from 20% to 33% by 2020. The dramatic increase in allotment of renewable energy sources has created a large demand for projects that are scalable to meet significantly higher mandated demand. To speed up the process, Governor Schwarzenegger has signed an Executive Order to create a Renewable Energy Action Team (REAT) to reduce the time of project permitting. Off-take: Proposed long term, 20+ years, off-take agreements for the generated energy will be negotiated through a Power Purchase Agreement (PPA) with the local investor-owned utility, Pacific Gas & Electric, or multiple other investor-owned utilities, local municipal and co-operative authorities that have goals for renewable energy usage. These off-take agreements will be negotiated with the utility customer and approved by the California Public Utility Council (CPUC).